Penned by David Wood, commonly known as ‘The Dozing Dragon’ across the net. 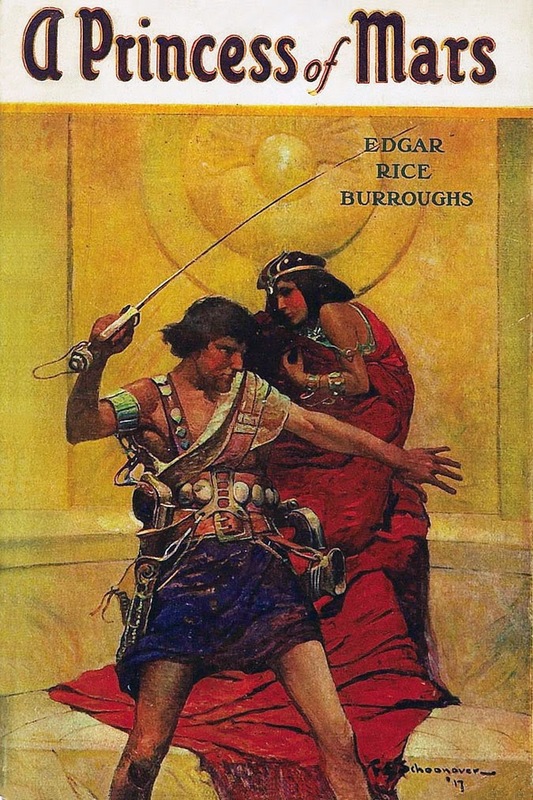 The original cover by Frank E. Schoonover from A Princess of Mars, McClurg, 1917, a Chicago based publisher made famous by the original publishing of ERB’s works. 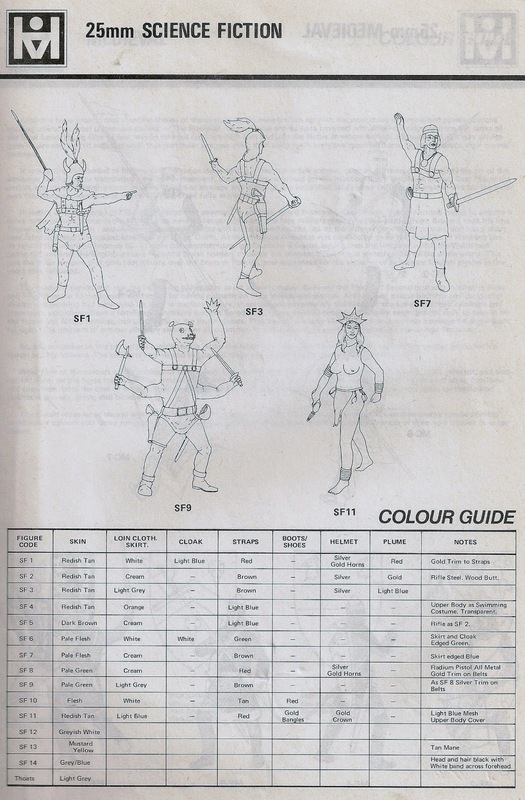 Six decades later, TSR took up the gaming gauntlet and in 1974 produced an A5 rulebook. 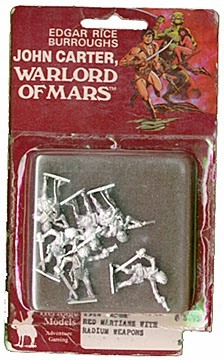 ‘The Warfare of Barsoom in Miniature, Rules for individual and large-scale land and aerial conflict’. 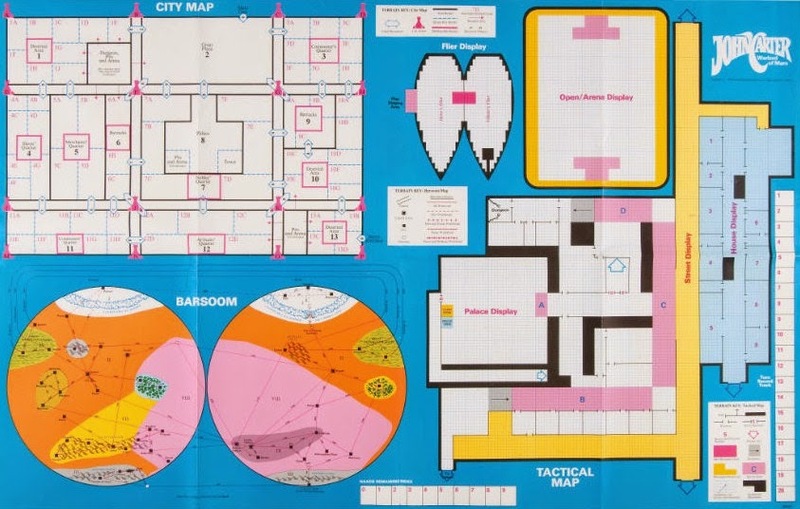 These days it can be purchased off Ebay for some serious $ but it can also be downloaded from a number of sources…….the original is a nice piece of gaming history to have in your collection though! Written by Gary Gygax and Brian Blume, TSR never got permission for this - another example of early licences and the casual infant hobby approach. 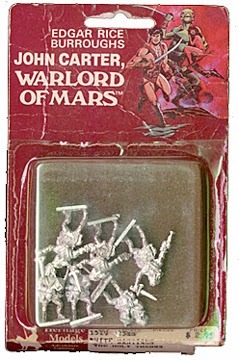 Towards the end of 1976 Grenadier released a short-lived ‘John Carter Warlord Of Mars’ series – this was quickly discontinued after failing to get the licence or possibly realising there was a licence fee to pay! 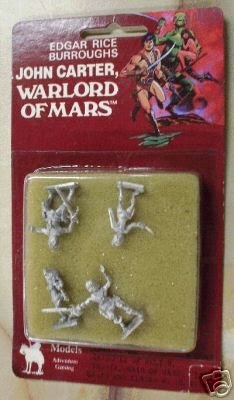 The figures were repackaged into the Gamma World line. It would be a joy to find the original card artwork if there was any! 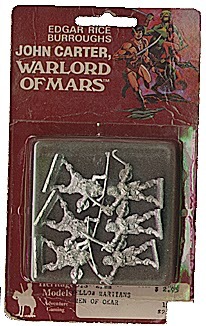 In the later 70’s Heritage Miniatures Inc. took the bull by the horns and released rules and a licensed range sculpted by Max Carr and David Helber. 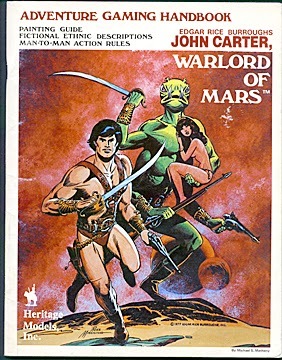 The ‘John Carter, Warlord of Mars’ adventure gaming handbook was published by Heritage in 1978 and penned by Matthew S. Matheny. 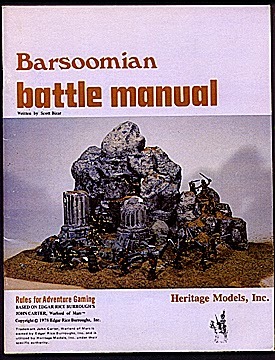 A wargaming rulebook which included separate rules for air to air action between the various navies of Barsoom. There were some earlier versions of some creatures that did not pass the licence checks. John Carter, the incomparable Dejah Thoris, Kantos Kan and a diorama nameplate. John Carter riding a Thoat with Dejah Thoris and Woola. I spoke to Howard Barasch, Head of Operations and the President of Heritage Models Inc in its heyday. SPI (Simulation Publications Inc.) released the boardgame in 1979. Designed by Eric Goldberg and Mark Herman, the box artwork was by Don Maitz. A range sculpted by the late Peter Gilder - has anyone else noted how many of the old school sculptors are now ‘the late’…? Sculpting style had some similarities with that of the Heritage line but I always felt that his heart was not in it – Peter Gilder was a historical man from head to toe. There were apparently different versions of some of the figures – I have yet to pick any up but live in the belief that I will at some point. 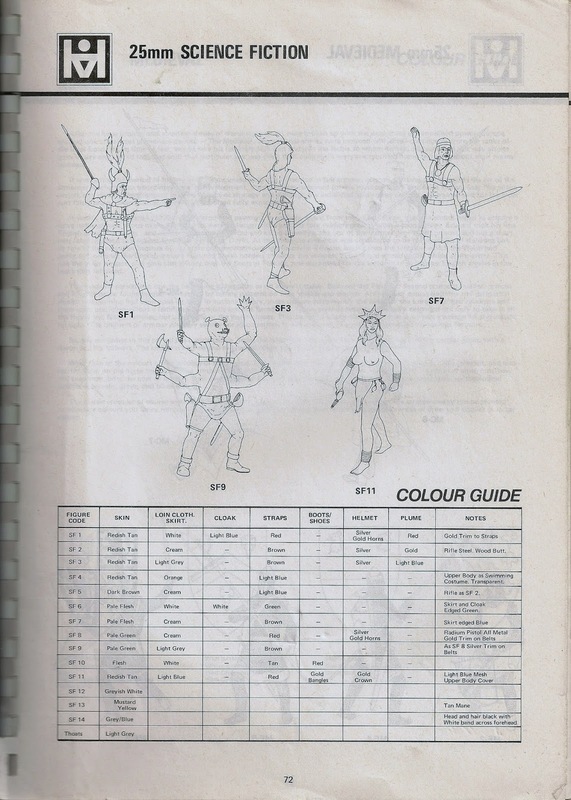 The descriptions below are mine as I have not found an ‘official’ listing…....the Hinchliffe Handbook of 1976 only gives the SF numbers in the painting guide – and only up to SF14. Strangely enough it then gives the ‘Thoats’ colour scheme (a ‘subtle’ hint as to what the range was actually designed for) and does not list any further numbers. See the scan below – line drawings by Norman Swales. 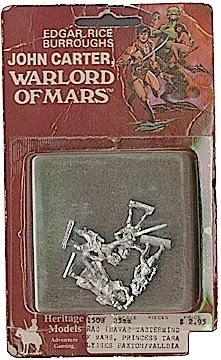 SF10 Hero, possibly John Carter himself! SF15 Unknown release – please contact me if you know it! SF16 Red Martian trooper, mounted on Thoat. 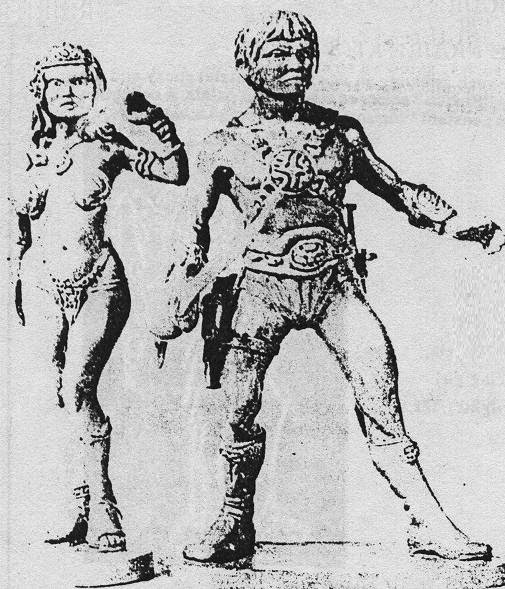 Two larger scale (90mm) sculpts by the late Ray Lamb representing John Carter and Dejah Thoris, subtly titled Warrior of the Red Planet (FA04) and Mistress of the Red Planet (FA05). I am still looking for these…. 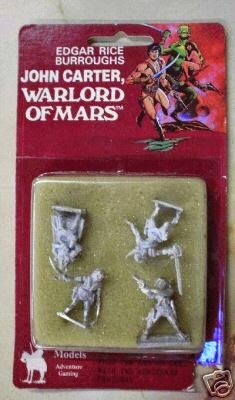 I have spent the last few years believing I had them in my collection and have just found out the ones I have are Greek God types. 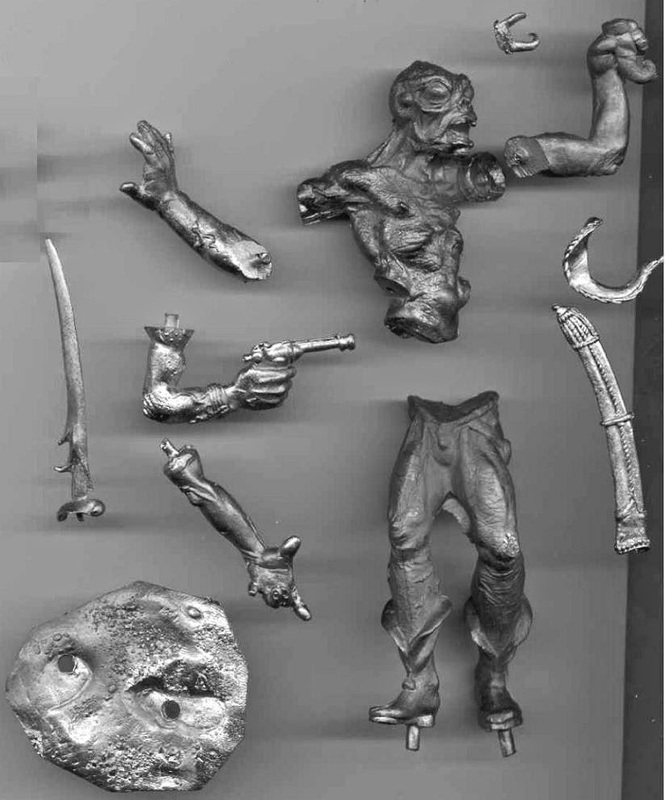 Most unfair and shows what age does to memory…..
As a side point though, John Carter was the name of a New York model maker hired by Comet Metal Products in 1962. Comet later became Superior Models Inc. 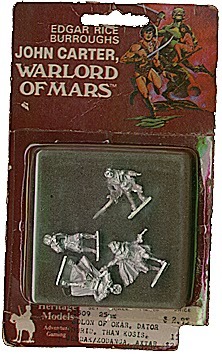 These may come back into production via Perth Pewter www.perthpewter.com who started as a division of Superior in the mid 70s and still produce many classic figures from the 70s and 80s. Check http://www.alnavco.com/c_history.htm for more details on Superior’s history. Stan Johansen sculpted a small range in the 70s. Apparently his wife was reading the books and said they would make a great range of figures. 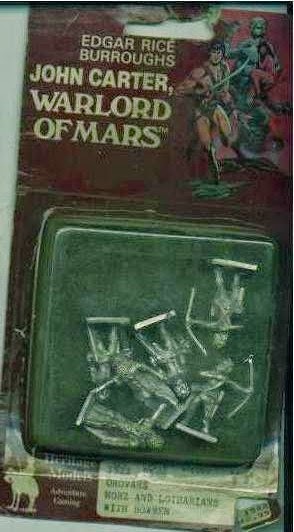 The sculpts consisted of 5 Red Martians, one mounted as shown, 3 male and one ‘Princess’ Also 2 Green Martians, one mounted on large Thoat and one on foot. 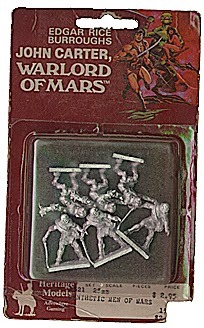 They were true 25mm with the Green Martians being a scale 15’ as per the books. 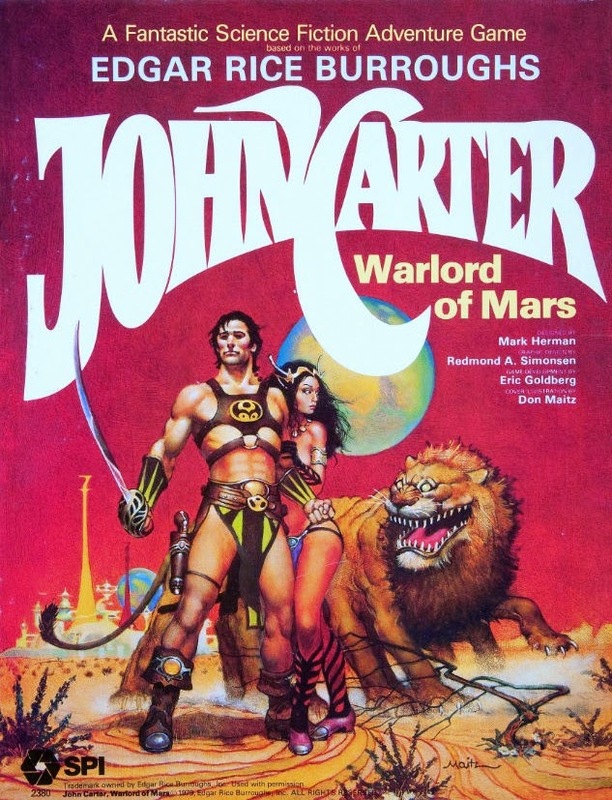 Stan told me he was doing them for his own amusement but at gaming conventions no one had any idea of who John Carter of Mars was although they were recognised at some Sci-Fi conventions. 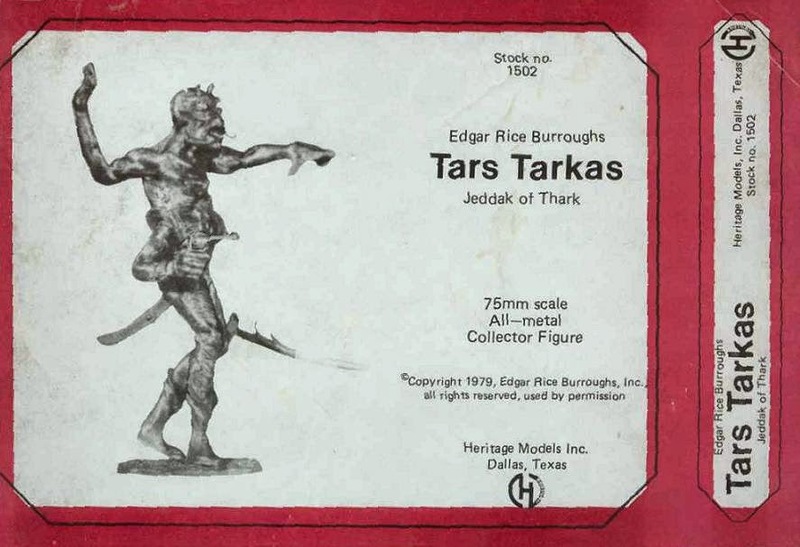 He did have plans to sculpt all the peoples and creatures of Barsoom but with the lack of interest and the fact that Heritage got the licence he abandoned the project completely. Martin Goddard designed a small (well….15mm and no pun intended) range in the 1990s……not quite old school (although Peter Pig has been going for 25 years….) but deserved of a mention as they are rather nice…….from his Range 19 “War in the Age of Magic”. The ‘Large Green Aliens’ were sculpted first in 1997 followed by the ‘Red Aliens’ in 1999. Drop in at www.peterpig.co.uk and mention where you found out about them! 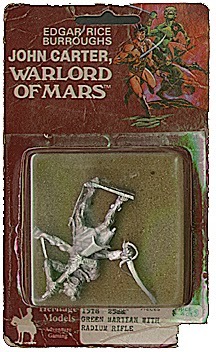 Since the days of the ‘old school’ there have been numerous companies producing miniatures suitable for John Carter. 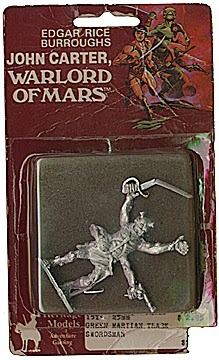 Sculptor David Sonderquist’s miniature company – a wide and growing range of excellent sculpts. 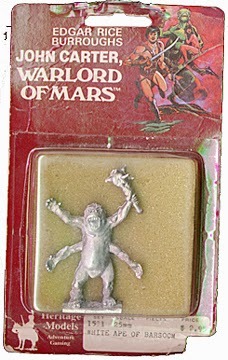 A small range of exquisite minis sculpted by John Winter, available in both normal and ‘R’ rated version! A quite varied range sculpted by the legendary Bob Charette, look to the ‘Extraordinary Personages’. Currently distributed by Brigade Games. 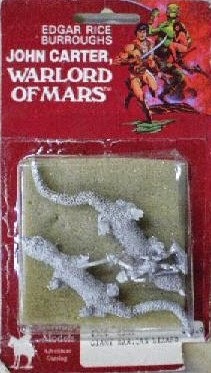 A different type of Martian range, sculpted years ago by Bob Murch for the GDW game Space 1889. 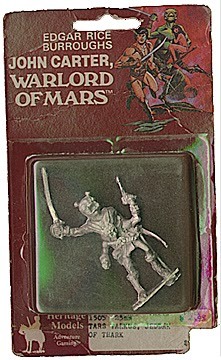 Sculpts have stood the test of time although again no JC. 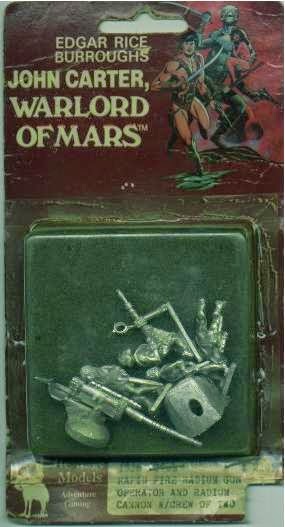 18mm Martian series – no JC but some nifty pieces in there. Collecting lead is my passion……or one of them as I am married with 4 children….I run a blog, non-political despite its name, which I update quite regularly these days. 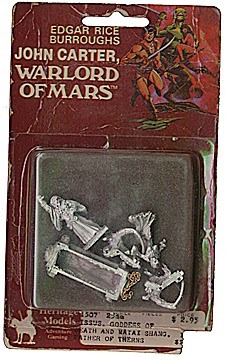 I don’t bite and do love to correspond about miniatures.